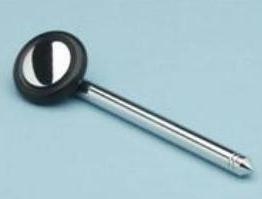 Telescopic Rabiner type patella hammer has a chrome with pointed tip. The 4.8 cm diameter head may be used in horizontal or vertical positions without unscrewing handle. Telescopic range 16.5 to 37.2cm. Convenient for carrying in bag.